From the busy west side street you first notice oak trees springing up from behind the old gray stone wall. Once through the iron gates your thoughts change instantly as you enter the only remaining aspect of Camp Chase. It is the final resting place of 2260 confederate soldiers. Their tombstones silently remind us of men who fought and died for the states they dearly loved. 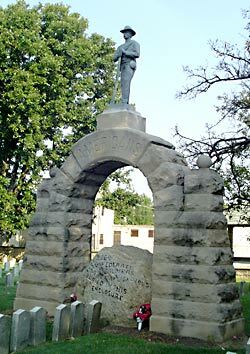 The graves of Texas Rangers, Alabama Artillerymen and Virginia Calvary are side-by-side with the sons of Mississippi, Missouri, Tennessee and Georgia. Walking amongst the stones you will occasionally find a tombstone with flowers and occasionally a small rebel flag. It is not hard to imagine families traveling from the deep south paying tribute to an ancestor who never returned home. When the Civil War began in April 1861, there was a massive outpouring of volunteers wanting to enlist in the army. In Central Ohio, those boys and men came to Columbus by the thousands. So many, in fact, there wasn't room enough to house everyone. Tent cities were built wherever there was open land, including the Statehouse grounds. The brand new Goodale Park was also used for housing the recruits and conduct initial training. Realizing a more efficient way to take care of so many people was needed, State legislators set in process to build Camp Chase in May 1861. The new camp would be 4 miles west of the of Columbus on land leased by the United States government. It was named for the first Republican Governor of Ohio, Salmon P. Chase who was at that time, the United States Treasurer under President Lincoln. If you look in your wallet you'll find his face on the $10,000 bill. The main entrance to Camp Chase was located along the National Road which today is Route 40 or Broad Street. As soon as the camp was completed, 1000s of soldiers in training from all over the city, were moved to the camp. Through those gates 4 future Presidents would pass, including Johnson, Hayes, Garfield and McKinley. As the soldiers completed their training, they would be transported by rail to various parts of the country. 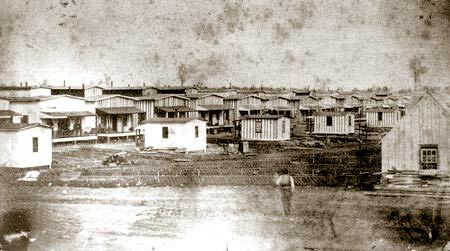 By November, 1861, the camp had fulfilled its training requirements. It was then converted to a prisoner of war camp. During the war years 1861 - 1865, 150,000 Union soldiers trained here as well as confining 25,000 Southern prisoners. Early on in the war, it was the custom to allow Southern officers to take a pledge of honesty which permitted them to walk the streets of Columbus, spend the night in hotels and eat at some of the fine restaurants within the city. Enlisted prisoners were not treated as well. During those early months and years, Columbus residents actually paid to take tours of the prisoner of war camp. However, as time progressed and the war dragged on, conditions at the camp began deteriorating. The public tours were stopped, and officers were no longer permitted to roam the streets. Having made my escape from the Federal prison located near Columbus, Ohio, I deem it due to the 240 brave but unfortunate Southern men whom I left incarcerated there on the 29th of October last to make known to the South and to the world the suffering and indignities to which they are subjected by their inhuman jailers. It will be remembered that Columbus is in a very cold country. The winter winds blow fiercely from those Northern fresh-water lakes over the State of Ohio and Camp Chase prison receives its full share of the chilling blasts. Yet while I was prisoner there, including the month of October, when the weather was very rainy and cold, no fires were allowed in the prison to warm the half naked and shivering prisoners. Promises were made from time to time by the subordinate officers that the prison should be warmed either by stoves or by a steam-heating apparatus but up to the 29th day of October no steps had been taken looking to that end. To add to the discomfort of the poor prisoners the wretched shanties, their only shelter, leaked badly, keeping the floors, their only bed, and even their scanty bed clothing soaked with water. This treatment of human beings by those calling themselves Christians is unparalleled. The food furnished the prisoners, with the exception of the bread, was of the most inferior kind and in insufficient quantities for the sustenance of the famishing men. The pork was absolutely rotten. But the great complaint was the difficulty in obtaining enough wood to cook the half-spoiled and scanty meal, only five small sticks per day being allowed for a mess of twenty-five men and that often not furnished until away in the night, leaving the men starving for want of their scanty meals during the entire day. It is but justice to the ladies of Columbus to say that they offered to furnish comfortable beds and bedding for us but were denied the privilege by the commandant because he said it was not permitted by the orders. When these kind-hearted ladies visited us in our vile prison and beheld our wretched condition they involuntarily burst into tears. They gave us all they were permitted to bestow--their sympathy and tears. I do not whine nor ask the sympathies of any one. I am loose from Yankee despotism and with my musket in one hand and the black flag of extermination to the foe in the other I intend to avenge my own and my country's wrongs. The camp was originally built to house 4,000 men at one time, but the prison population soon reached over 7,000 and by the end of the war there was an estimated 10,000 prisoners within the camp's walls. Oversight of the camp was then transferred to more disciplined Federal control. As the war progressed a new camp was built on Johnson's Island in Lake Erie to house the Confederate officers. Many of the officers located at Camp Chase were then transferred to Johnson's Island. Conditions in the camp worsened with disease outbreaks that quickly spread through the camp. 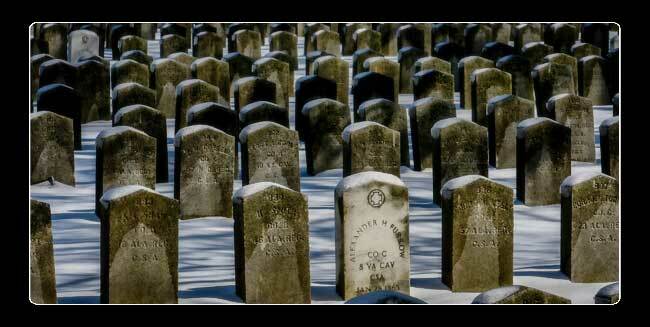 Many of the men buried in the cemetery died from a smallpox epidemic which swept through the camp in 1863. Before this, deceased prisoners were interred at local cemeteries. With the outbreaks of cholera in 1863, a cemetery was created at the camp. 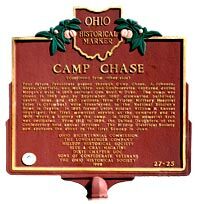 Camp Chase was one of the 5 largest prisoner of war camps in the North. After the war, the buildings were torn down as city development began to creep into the camp's original footprint. Soon, the only area remaining was the 2 acre cemetery. In time, even this fell into disrepair as the wooden tombstones rotted with weeds and trees reclaiming the land. William Knauss, a Union Army veteran, found the cemetery and began caring for it. He organized the first services and in 1906 wrote a history of the camp. A wall was built and the US government took responsibly for care and protection of the cemetery. Services are now held yearly on the second Sunday of June at 3:00 p.m. to remember these forgotten Americans. There is one more thing about the cemetery, some say it is haunted. 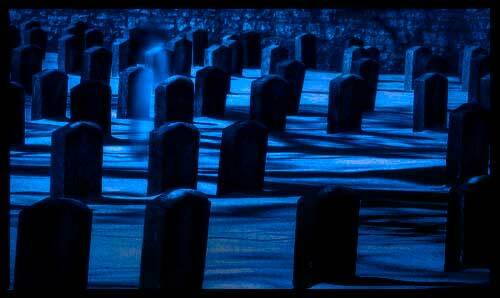 On more than a few occasions and usually late in the day, visitors and local home owners have seen a slender woman dressed in a Civil War period, gray traveling suit, walking within the cemetery. She has been called the Lady in Gray. 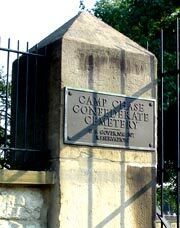 Camp Chase cemetery had a key role in the development of the federal government's policy on marking Confederate graves. Immediately following the war, Ohio governors took notice of the poor condition of the cemetery. In 1879, the federal government took over the title to the cemetery; however, the care of the cemetery continued to be poor. Ohio governors through the 1870s and 1880s continued to champion for proper care and attention for the cemetery.